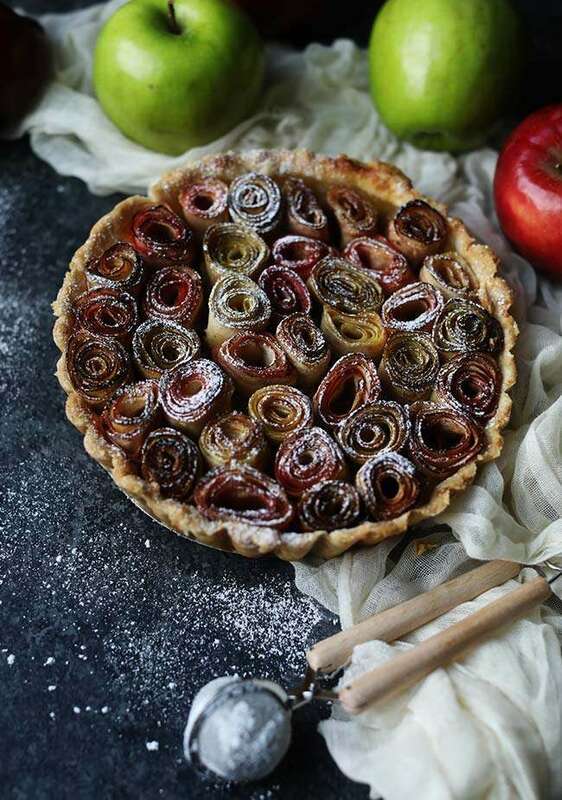 Homemade Rose Apple Pie Recipe with Cinnamon and Streusel: try this delicious apple pie where the apples are made into roses and served over a bed of brown sugar and cinnamon in an amazing homemade crust. I’ve been dying to make a rose apple pie like this for the longest time, but again finding time to do it is always impossible. Since I want to do a lot more videos on my site I’ve made it a point to put it on my calendar once a week just to make sure that I follow through with it. My daughter started school last week and the stressers of that alone has been beyond overwhelming for me. To be honest I’ve been getting migraines for the first in my life and I’m not sure if it’s work, or my daughter going to school for the first time but man it’s been quite a few weeks, so I figured baking would help calm me down and this rose apple pie was at the top of my list. Hope you all are cool with me being transparent but I believe we can get sucked into the glamour of social media without displaying the authenticity of everyday life. Well even though I haven’t been feeling the greatest, this Homemade Rose Apple Pie Recipe with Cinnamon and Streusel certainly did cheer me up. After editing this video I’m pretty positive it’s one of my favorites to date. From the music, to the close-up style, just like all of my videos, I love how this rose apple pie recipe came together. I’ve been shaving fruit and vegetables since culinary school so this isn’t a new thing, in fact I used to make roses from every vegetable I could get my hand on back in the day when I worked in catering, so this rose apple pie is nothing new to me. Now I’m absolutely not taking credit for this at all, but shaving apples and rolling them up like roses is something I’ve been dying to do in an apple pie for quite some time. There’s no denying that I am a HUGE fan of Netflix’s hit show “Chef’s Table,” and more specifically their “France Edition,” which features some really cool chefs in France. One of the most intriguing, and well know chefs in the world, Alain Passard showcases his “Bouquet of Roses” dessert which is the same concept as using thinly shaven apples that look like roses and then baked in a crust to make a rose apple pie. You can use a peeler, or one of the two gadgets listed at the bottom of this post to help get you there. Once the apples are shaved and rolled out, I brush them with a little lemon juice to help keep color and of course add flavor. I then sprinkle on some cinnamon and sugar and the roll them up. Boom, rose apple pie! Obviously, my Homemade Rose Apple Pie Recipe with Cinnamon and Streusel isn’t the same and I’m guessing it’s probably not even close. I’m sure our crusts are different, our ingredients on the rose apples are different and everything in between. What I’m trying to get at is that watching Chef Passard’s episode further persuaded me to make my Homemade Rose Apple Pie Recipe with Cinnamon and Streusel video. Now, I can’t even hold a candle to Chef Alain Passard so please know that I’m not trying to say that this concept of apple roses is mine, and at the same time it’s not something I stole. Ok enough with the awkwardness :-). Making a homemade pie crust for this rose apple pie recipe is so easy that I’m often dumbfounded when I find myself buying premade pie crusts from the store. Homemade crusts are 10 times better than the store bough and you most likely will enjoy it more since you made it. There are a few ways to make the crust for this rose apple pie, either in a food processor or by hand, which is what I did. You want to cut the butter into your dry ingredients using a pastry knife until the butter is the size of rice. From there it’s as simple as quickly kneading it together and chilling it for about 45 minutes before rolling it out and fitting it into your tart mold. I’m guessing one of the biggest differences in my Homemade Rose Apple Pie Recipe with Cinnamon and Streusel and Chef Alain Passard’s Bouquet of Roses is that I made a streusel, much like a crumble topping you put on an apple pie, except I put it under the apple roses to ensure those beauties were front and center. If you wanted to pizzazz the streusel up even more you could add some oatmeal or even use an almond meal instead of flour, totally up to you. Sprinkle the streusel into your molded pie crust tart and chill it! Almost done with this rose apple pie, I promise! Last but not least, making the thinly shaven apples for the rose apple pie requires a tool. It’s a vegetable ribbon shaver and I have the hand crank tool or you can save some time and buy the Kitchenaid attachment, there is a link for it right below this. Once the apples are shaved, brush them with lemon juice to help keep the color and then sprinkle on sugar and cinnamon. From there you roll them up and place them overtop the streusel. Bake it up and sprinkle on some powdered sugar and boom a beautiful rose apple pie. Happy Pie Baking you guys!! Here are some of my favorite pie recipes to date! Kick your dessert making up a notch with this amazing Homemade Rose Apple Pie Recipe with Cinnamon and Streusel! Crust: Add the ingredients to a food processor and pulse until the butter is the size of rice. In the same manner add all the ingredients to a medium size bowl and cut together using a pastry knife until the butter is the size of rice. Knead the dough for 1 to 2 minutes and chill for 45 minutes. Take out the dough from the refrigerator and roll it out until it is 1/8” thick. Mold to an 8” tart shell. Remove excess and set aside. Streusel: In a medium size bowl cut together all ingredients until the butter is the size of rice and sprinkle it into the bottom of the pie crust tart shell. Chill. Filling: Roll out each shaven apple and cut into 2’ feet sections. Brush with lemon juice and evenly sprinkle on sugar and cinnamon. Roll each apple up to make a rose and cut in half. Place the roses right onto the chilled streusel pie crust until it is tightly packed. Drizzle the top of the pie with melted butter and bake for 45 to 50 minutes or until lightly browned on top and cooked throughout. Cool completely before dusting with powdered sugar and serving. This turned out SO beautiful Billy. Sorry to read about your migraines, but love that you were still able to accomplish such a gorgeous video in the midst of a rough time. Thanks Diana, super happy with how it turned out. Hopefully these migraines are gone for awhile and preferably forever! That is ridiculous. The artistry and patience that goes into a multi, multi step process like creating this is admirable. Would a mandolin work to shave the apples? You could use a mandolin, fan them out and roll them up to make little individual roses.